It does fit in perfectly! I think it is so sweet and it has such a great message! I think it fits perfectly! Look at the pretty colors and there is even a little cottage home at the bottom. But, you are right! If you love it, it fits! Your place is so cute, you have no worries there my dear. Your sampler is beautiful! 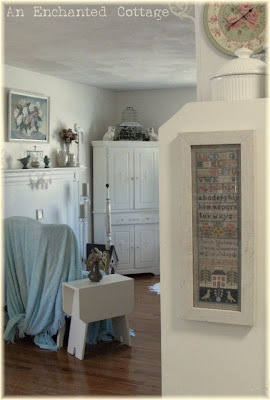 I agree that keeping things you made, found or that have special meaning to you really does make a house a home! 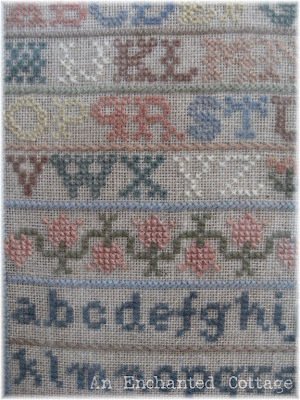 Yes, lovely sampler. I haven't cross-stitched for a long time now, but I don't know why as it is so relaxing and enjoyable. What a beautiful sampler. I don't have the eyesight or the patients to cross-stitch, but envy those who can. It is really a wonderful piece of art work! I love the message! You are right, if you love it, use it; to me, that's what makes a happy home, having the stuff I love all around. I agree with you. We need things around us that make us happy. If we love it then its great. I love the way you have that blue throw arranged and sort of knotted over the wing back chair. Would you tell me what size blanket that is. I think that it looks beautiful. The colors are pretty. It looks perfect there. And it is special, which is all that really matters. The sampler looks great!!! 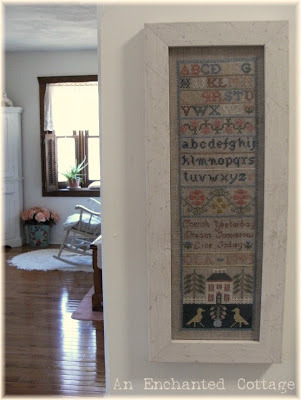 I am a cross stitcher also...and mostly samplers. My wall of samplers fits great in with my English looking cottage decor. There is painted furniture...but not white. 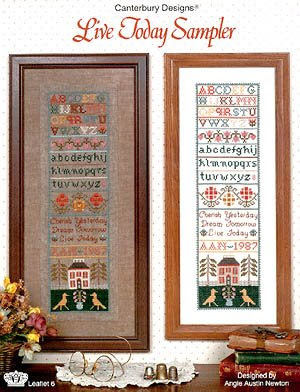 Do you remember the designer of that sampler? It is very pretty! it's LOVELY!!! your home is lovely!!! Cottage to me is not a color or a style. It's a way of life. It's learning to live in a smaller space with the all the things you love. I LOVE your cross stitch sampler. It's gorgeous.